Before the old (Kansas City) cars were taken off for good, a farewell trip was made in them, gaily decorated with flowers and flags, and a party of children, officials, and newspaper men took a last ride. But the mules! Perhaps the oldest one in the service of the company and one that has faced the vicissitudes of earlier times, is "Old Buck" who was purchased by Mr. Holmes when but three years old, and has served the road for eighteen years, day in and day out. In that time he has traveled 137,970 miles. He is a type of them all. "Kit" and "Nellie" are next in term of honorable service, each having served sixteen years. They were all thoroughly trained and knew their route by heart. Without any word they would stop at either end of the line, turn, and make ready for the return trip. Many journeys had familiarized the road to them. When the three above-mentioned mules were thrown out of employment by the new electric cars, many interesting letters were written by people who advocated the pensioning of the three by the company. However, the whole lot, ninety in all, were sold to Capt. Tough, who disposed of most of them to southern parties who will work them in the cotton fields there. When it came time to take them to the stock yards from the old barns for the last time, a ludicrous and pathetic incident took place. The men whose business it was to drive them down to the stock yards, were met with a stubborn resistance on the part of the mules who refused to leave their old homes. They scattered wildly, and all efforts to drive them were in vain, until they found the bed of the road, when they amiably struck their old gait until they reached the terminus, turned tail and made the return trip. This was repeated several times until the idea of driving them was abandoned and the mules were declared victors. Next day, however, the men returned and led each down at the end of a halter, and that was the last glimpse these good, faithful fellows had of their old home. They had been outclassed by electricity. The following sketch was written by a former St. Louis newsman and was published in the early part of the century. Excerpted with permission, from "Streetcars at the Pass" by Ronald E. Dawson. 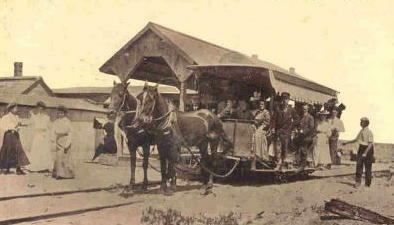 The street car system of El Paso consisted of four or five dinky cars, each one drawn by a decrepit mule. Of these mules the hero, the patriarch, the town pet, was Mandy. 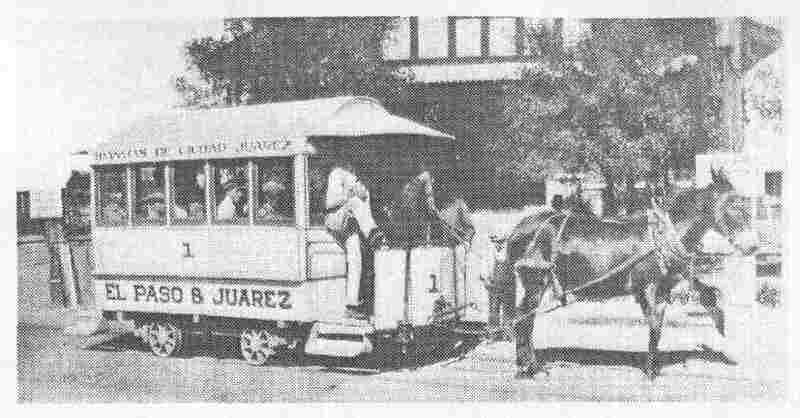 Fifteen years ago the street car service of El Paso consisted of one car, one driver, and one mule, and that one mule was Mandy. (Note: this would have been about 1890 and there were a number of cars and mules by then.) She had been a veteran of the San Antonio street car system. She slaved for those people until she was thought to have outlived her usefulness. Then, between fifteen and sixteen years ago, she was brought to El Paso to perform the easier task of hauling the sole streetcar of this village. From that time there never was a day when Mandy failed to drag the car throughout the weary route around and about El Paso until the present (1905) superb electric car system was installed three years ago the eleventh day of this month. 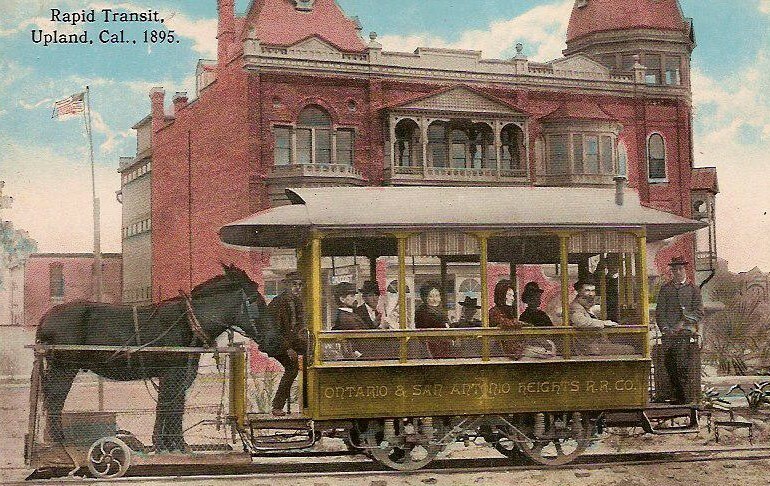 During those twelve years or so of local streetcar servitude, Mandy came to be the best known and most popular object in El Paso. It was no uncommon sight to see women stop Mandy on the street and feed her a handful of daisies. Children used to play tag under Mandy and around her legs and fearlessly pull her tail. Mandy had the reputation of being able to walk slower than retributive justice after a wealthy criminal, and could trot slower than any other mule could walk. Long after the present generation has passed away Mandy's name will be spoken daily in El Paso homes. One frequently hears such expressions as "so and so is as good natured as Mandy", or "that boy is slower than Mandy", "I have waited as patiently as Mandy", etc. It was my fortune, when in El Paso six years ago, to ride in a car drawn by Mandy. I shall not say how slow we traveled, because if I did, I would not be believed. After riding and waiting, principally waiting, for an hour or two, Mandy came to a dead halt in the middle of a block and, to all appearances, went to sleep. The driver urged her in soporific tones to proceed, and finally he shook the lines gently. Still there was nothing doing. Mandy slept. The driver calmly resigned himself to the inevitable, sat down on his stool, rolled a cigarette and placidly smoked. Losing patience, I accosted him. "Why don?t you make that mule go?" I asked. "Cos is ain?t in a goin? humor", he answered serenely. "Why don?t you whip it?" "Ain?t got no whip" he answered, beginning to look sullen. "But there are lots of loose rocks on the street", I persisted. "Pick up some of them and pelt him with them." The driver rose from his stool, threw away his cigarette stub and eyed me scornfully. "Stranger", he said, "that mule is Mandy. If I should hit Mandy, I would be shot before I had time to draw another breath. He's a privileged character-that old mule is the adopted child of this town." Then he rolled another cigarette, touched me for a match and resumed his smoke. I left the car and walked the remainder of the distance. It is said that Mandy was retired after a number of years and was used by the company collector to ride home for lunch. Mandy was as reliable as a horse for personal transportation. When the present up-to-date electric street car service was instituted three years ago, all El Paso united in a grand celebration. All the new cars were joined together and run about town all evening, and riding was free for as many people as could crowd aboard. There was a band and speech-making and a great pow-wow; but more impressive than anything else, in front of the electric car procession, was a flat car covered with wreaths and chain festoons of flowers, with Mandy riding. Mandy was far more the object of interest of that gladsome occasion than were the new cars. The celebration ended at midnight, and the procession came to a halt in front of the new carbarns. Mandy was escorted from the car to the ground. Then Mandy gravely walked to a position alongside one of the new cars, turned so as to present her heels to the enemy, and proceeded to do her best to kick that modern improvement to smithereens. That was the first time Mandy was known to kick in all of her El Paso life, and the kindly endeavors of a score of men were necessary to get her away from the scene of the demolition. The next day Mandy was sent out to an irrigated pasture, where she stood in grass and alfalfa knee high, there to end her days, with nothing to do but eat and drink. But eat she could not, and drink she refused, and in a few days Mandy passed away-died of grief because of the affections of her loved people of El Paso, she had been supplanted by an infernal invention which had no gratitude for kind words and caresses and no taste for apples and lumps of sugar. Dead, not from old age-because Mandy was not more than 50 or 60 years old- but dead from a broken heart. There is a road leading out of El Paso to the Southward. It is a good road and the much-traveled road is the favorite road with El Pasoans when they go pleasure driving. One mile from town beside this road, there is a grave, and at the head of this grave there is a stone, not a board, but a sizable well-squared block of granite, and on the face of that stone is deeply carved one word, and that one word is Mandy. The grass grows green over that grave now, and flowers are often laid upon it-and many an El Paso woman when she alights from her carriage and bends over that grave and moistens the earth with a tear or two which springs from a loving memory. Fine big cars whiz and whir through El Paso now. But many an old-timer, as he boards one of those elegant electric cars, breathes a sigh for the good old days.......and Mandy. 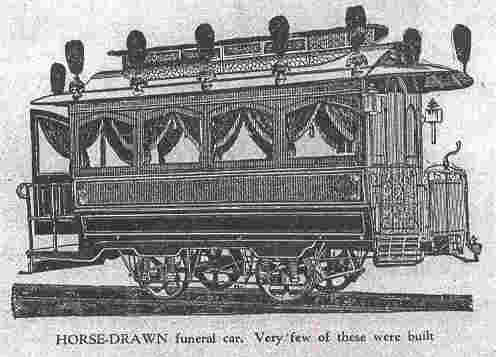 One of very few horse drawn funeral cars ever built. 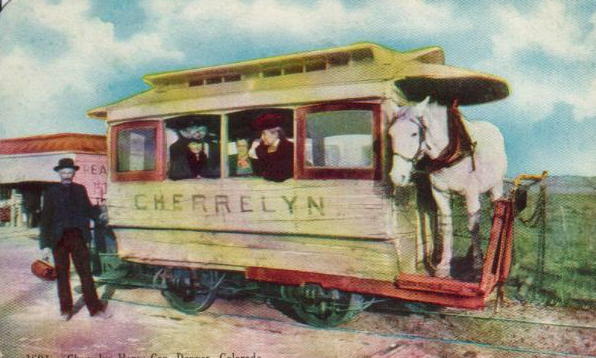 Although the Cherrelyn line in Colorado is by far the most famous, there were other lines where the animals were allowed to ride where feasible. Pictured is a car on the Ontario & San Antonio Heights R.R.Co., in Upland California. A rather outlandish New Orleans experiment. "On small lines, where the same driver and team worked regularly together, an affectionate relationship was not uncommon. Once, this mutual esteem caused a derailment and considerable commotion in Canandaigua, New York. The driver involved had become very friendly with a pair of mules, made pets out of them, and taught them to chew tobacco, a practice of which they became very fond. Running out of tobacco one day, he left the car briefly, bidding his passengers and the mules to wait a jiffy while he bought three plugs. He was in a tobacconist's around the corner when a crashing noise outside, accompanied by screams, informed him that his friends had wrenched the car off the rails and dragged it partly over the sidewalk in their eagerness for a friendly chaw!" To give you an idea of the number of horses needed, to provide service on a large city system, the West End Street Railway of Boston, at one time ran the worlds largest horse car system. They had to maintain about 8000 horses in order to provide daily service! A stove to provide heat, and one example of a lamp used in horse car service. The great expansion of horse drawn railways came after 1852 when Alphonse Loubat developed a grooved rail that lay flush with the pavement. 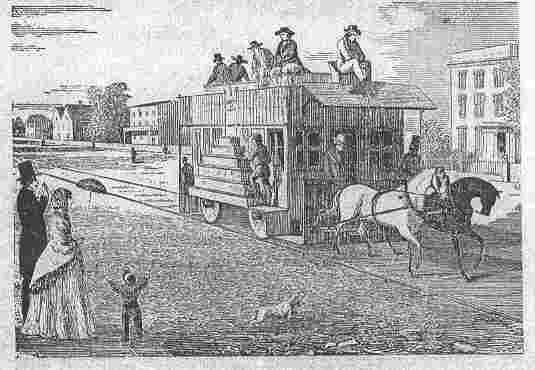 This was an essential improvement because the earliest horsecars had used rails that protruded six inches or more above street level, seriously interfering with coach and wagon traffic. 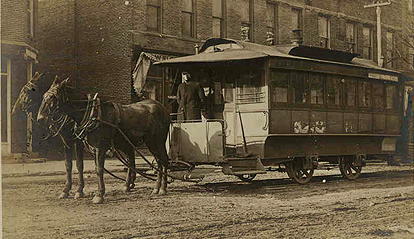 "The golden age of the horse car was the decade between 1880 and 1890. 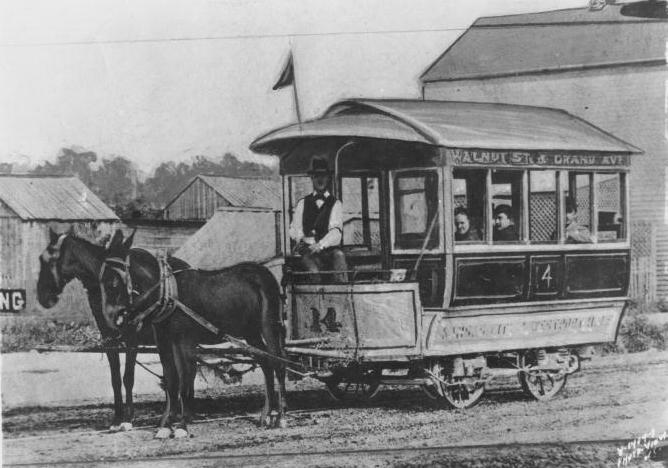 A Boston transit magnate at that time told a convention of the American Street Railway Association that the country had more than 100,000 horses and mules engaged in pulling 18,000 cars on 3000 miles of track. 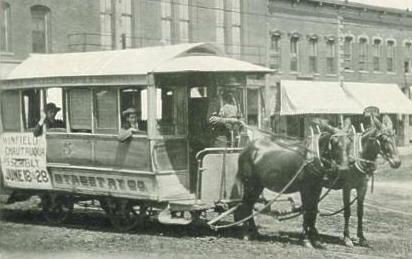 In about 1880, the Pullman Palace Car Company started building horse-drawn street cars at their Detroit shops and later at the Pullman car works in Chicago. FROM THE RULE BOOK: "Whipping horses is strictly forbidden. No whip shall be carried without special permission." "The driver is not expected or required to drive a lame or disabled horse." "The driver must either get down from his car and remove from the track all stones, nails, and other things injurious to horses, or call the conductor to do it." "About fifty years ago, while riding an open horse-car in Chicago with my mother, I was the proud owner of a whistle, similar to the one the conductor used to signal the driver. The conductor blew once for stop, twice for go. The horses, accostomed to a couple of toots, would start as soon as they heard them, without waiting for orders from the driver. Every time the car stopped for riders I would blow my whistle twice whereupon the horses would move before the passengers had time to get on or off. Instantly, then, the conductor would blow one blast to stop again. This farce kept up for several blocks. I was having a lot of fun- until the conductor found out where the whistle came from; then he was ready to throw my mother off for letting me behave so outrageously.".....O.B. Fensholt, Beloit, Wisconsin. One of the vital problems in mass transportation which agitated the brass hats of those days was whether or not a mother should be permitted to nurse her baby at the breast in a public vehicle. The following solution was offered by the Street Railway Journal in 1885: "A baby can best judge of the necessity and expediency of taking its usual refreshment; and when it has signified its imperial wishes to its mother, she had a divine right to turn any conveyance into a dining car if she pleases, and there is no indelicacy in the act." "The well horses we work the same hours each day, on routes that are suited to them. Fitty and low-bred horses, and those that cannot stand the sun, are assigned to early and late trips." 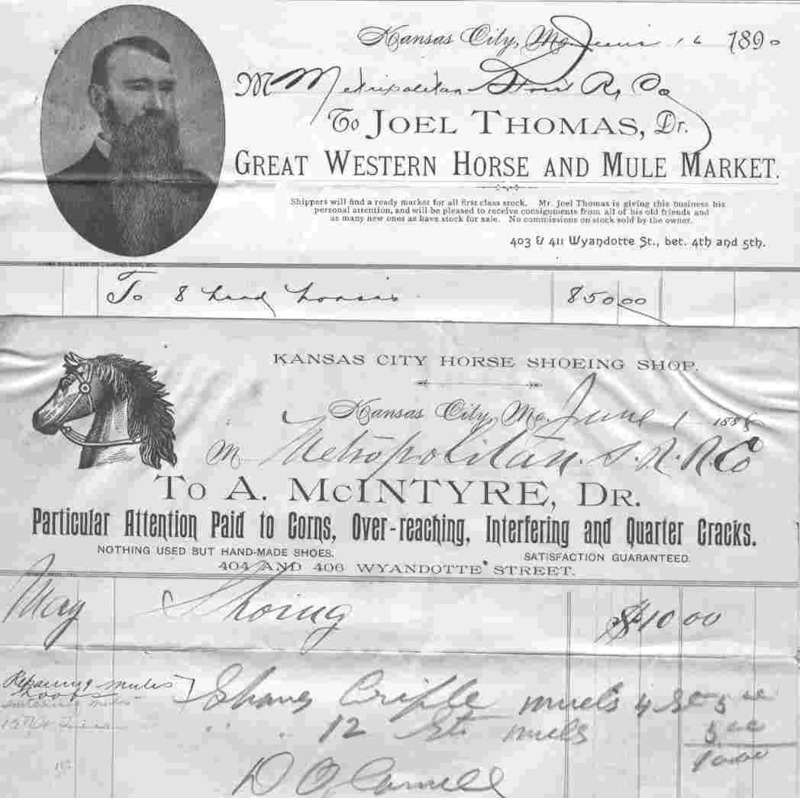 Horses may have run from $150 to $200 each when purchased by the railway, but probably half that cost could be recovered by the sale of the horse when its usefullness to the railway was ended. The same was not true for the mule, because while their initial cost was not as high, there was usually little market for the old mules. 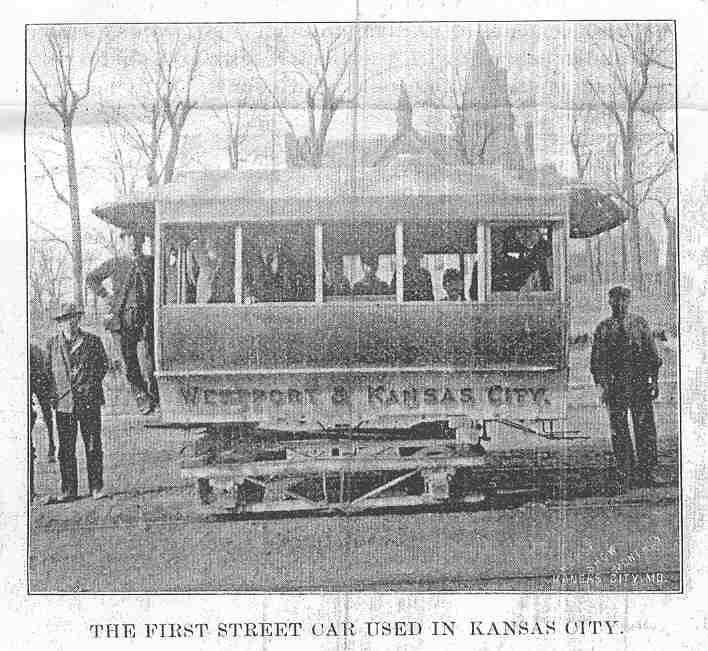 "On June 16, 1890 the newly organized Metropolitan Electric Railway acquired rights to all street railway business in Springfield except for a small line operating from Public Square out to the Poor Farm situated in Kickapoo Prairie. This little Kickapoo Transit company was the sole competition to the big Metropolitan for over a decade. Kickapoo used two mules from its beginning in 1890 to 1903 when electricity was substituted. The fare was 5 cents, and the firm made little revenue. However, the Conductor made extra money by running errands for people who lived along the line. When the last mule car retired from service on the line, at 2:00 P.M. October 15, 1903, we are told by a Springfield newspaper, that the mules themselves were put out to pasture, but one of them was so lonely and restless that, on one occasion, it got loose from the barn and chased the new electric car down the street braying with a wide-open mouth, apparently wanting to be put back in harness!" During this unique era a few cars were designed so that once the hill was conquered, the horse or mule was allowed to board the car and RIDE back down the hill! 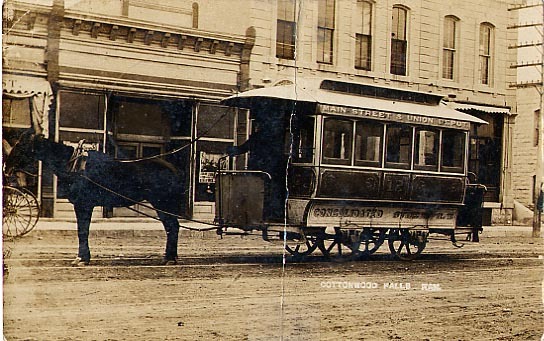 The natural outcome of horses pulling streetcars up and down the same path all day was a concentrated accumulation of manure in the middle of streets and in stables. "A big-city streetcar system that made a quarter-million dollars a year in fares could probably get an extra $10,000 from the sale of manure." Laying track cost $5,500 a mile, according to an 1873 estimate. In today's money, that would be about $80,000 a mile. First appearing in Canada in 1872, the "Great Epizootic", an equine influenza, spread rapidly through the eastern U.S., reaching Louisiana in only 2 months. Thousands of horses died and many more were sick and unable to work. 18,000 horses in New York alone were too sick to work, while in Philadelphia horses died at a rate of nearly 200 per day. Nearly 2250 horses died in that city alone in a three week period. That the epidemic spread so far and so fast baffled veterinarians because it could not be explained by contact from one horse to another.